In March 2019, the Consumer Price Index (CPI) went up by 2.3 percent year-on-year. The prices grew by 2.3 percent in cities and 2.3 percent in rural areas. The food prices went up by 4.1 percent, and the non-food prices increased 1.8 percent. The prices of consumer goods went up by 2.4 percent and the prices of services grew by 2.0 percent. In the first quarter, the overall consumer prices were up by 1.8 percent from the same period of the previous year. 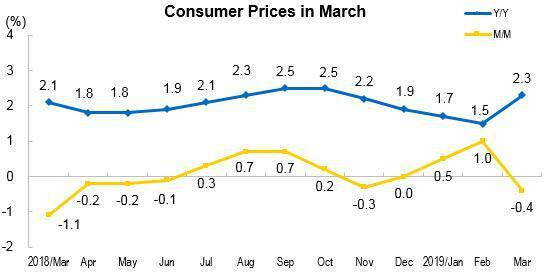 In March, the consumer prices decreased 0.4 percent from the previous month. Of which, prices in cities decreased 0.4 percent, and 0.3 percent decrease in rural areas. The food prices went down by 0.9 percent, and the non-food prices went down by 0.2 percent. The prices of consumer goods decreased 0.1 percent, and services down by 0.8 percent. In March, Prices of food, tobacco and liquor went up by 3.5 percent year-on-year, affecting nearly 1.04 percentage points increase in the CPI. Of which, the prices of fresh vegetables up by 16.2 percent, affecting nearly 0.42 percentage point increase in the CPI; fresh fruits up by 7.7 percent, affecting nearly 0.14 percentage point increase in the CPI; meat, up by 4.7 percent, affecting nearly 0.20 percentage point increase in the CPI (price of pork was up by 5.1 percent, affecting nearly 0.12 percentage point increase in the CPI); poultry, up by 4.0 percent, affecting nearly 0.05 percentage point increase in the CPI; grain, up by 0.4 percent, affecting nearly 0.01 percentage point increase in the CPI; eggs down by 4.1 percent, affecting nearly 0.02 percentage point decrease in the CPI; Aquatic products，down by 3.0 percent, affecting nearly 0.06 percentage point decrease in the CPI. Among the prices of other seven categories, all increased year-on-year. Of which, the price of health care, education, culture and recreation, residence, increased 2.7, 2.4 and 2.1 percent respectively; the prices of clothing, other articles and services, increased 2.0 and 1.9 percent respectively. The price of household articles and services, transportation and communication increased 1.2 and 0.1 percent respectively. In March, Prices of food, tobacco and liquor went down by 0.6 percent month-on-month, affecting nearly 0.19 percentage point decrease in the CPI. Of which, prices for eggs, down by 6.0 percent, affecting nearly 0.03 percentage point decrease in the CPI; Aquatic products，down by 3.6 percent, affecting nearly 0.07 percentage point decrease in the CPI; fresh vegetables went down by 2.6 percent, affecting nearly 0.08 percentage point decrease in the CPI; poultry, down by 1.2 percent, affecting nearly 0.02 percentage point decrease in the CPI; meat, down by 0.1 percent (price of pork was up by 1.2 percent, affecting nearly 0.03 percentage point increase in the CPI); fresh fruits went up by 0.3 percent, affecting nearly 0.01 percentage point increase in the CPI. Among the prices of the other seven categories, three increased, four decreased month-on-month. Of which, the prices of clothing, residence, health care, increased 0.6, 0.1 and 0.1 percent respectively; both household articles and services and transportation and communication decreased 0.3 percent; the prices of education, culture and recreation, other articles and services, decreased 1.6 and 0.5 percent respectively. Consumer Price Index (CPI) is an index measuring changes over time in the price level of consumer goods and services purchased by residents, which comprehensively reflects the changes of price level. Consumer Price Index (CPI) covers the prices of goods and services of 8 categories and 262 basic dishvisions which cover the living consumption of urban and rural residents, including food, tobacco and liquor; clothing; residence; household articles and services; transportation and communication; education, culture and recreation; health care; other articles and services. The prices collection units are selected and determined by sample survey methods, and the original data of consumer prices are collected by specific person in fixed place at fixed time. Data are collected from 88,000 prices collection units in 500 cities and counties of the 31 provinces (autonomous regions and municipalities), which cover shopping malls, supermarkets, open fairs, service outlets and Internet E-commerce suppliers. The total data is the same as the high or low value of the classified data sometimes because of the "rounding" reason.